With Thanksgiving behind us, all your little darlings will have visions of Christmas magic dancing in their heads on Monday morning. Now is the perfect time to stock up on seasonal (or year round) teaching resources at Teachers Pay Teachers so all is calm in your classroom until the holiday break begins! Enter below for the opportunity to win a $10.00 TpT gift card for your holiday shopping. Then visit all twelve educators’ blogs in this hop for a chance to win a $10.00 gift card from each one. There are three ways you can enter my raffle. Leave a comment on any of my blog posts. Comment on this post by sharing any helpful holiday season teaching tips. Visit my Teachers Pay Teachers store. Download one of my freebies and provide feedback. Go ahead and hop on over to Kathleen at A+ Kids Bloggin’ for another chance to win a $10.00 TpT gift card. 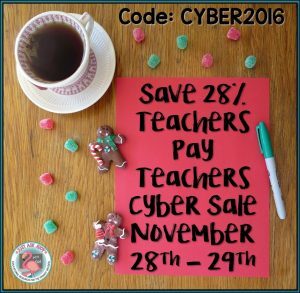 Whether you win a gift card or not, be sure to shop Teachers Pay Teachers Cyber Sale on November 28th and 29th. All resources in my TpT store, including my popular Addition Fact Mental Strategy Bundle and Subtraction Fact Mental Strategy Bundle, will be 20% off. Enter code CYBER2016 at checkout and TpT will take another 10% off your purchase for a total discount of 28%! I love to save some special plans and crafts for the last week or so before the holidays. I have some great ideas posted on my blog! Hoping all will be calm in my classroom until the holidays! LOL! Thank you so much for joining! My students get more anxious the closer we get to Winter Break (not enough food at home, not enough structure, unsafe, etc.) so the last week we play a lot- Lego, more recess and meditative coloring. Not very academic but way less stressful. Stick to routines and stay calm. A great blog! Thank you for the chance to win! My holiday tips are to not procrastinate! Try and do your work as soon as possible so it doesnt weigh on your mind. I love to make special crafts during the holidays for students to take home. Love doing crafts! Any craft ivory is fun and exciting, especially when I can tie it in with a seasonal book! I use a movie advent calendar – each day, turn the number around and there's a Christmas movie on the back, we either watch during break (choice), or if well known, discus and do activities based on it! Holiday teaching tips: Allow students to share about their traditions and how they spend time with family. No mention of gifts permitted. One of my holiday teaching tips is to keep your classroom routine going as best as you can through the last weeks before break. It helps the kids behave better!